Studio Tour Part 5: Does Love for Torches make me a Pyromaniac? This is my trusty little workhorse. We have a relationship. I mean, you have to really. At first he was a little wishy-washy...afraid of the commitment, you know. But now, we are so steady and happy together. Ok, so all kidding aside, I had to wrangle this one. I know it sounds funny, but setting up a torch is a big deal, especially when your roomate is watching you hook up a propane tank in the corner of your bedroom in a tiny second floor Philadelphia apartment. "Is that safe?" She'll ask. Probably not, you think while wrenching away at the thing. The thing is, I knew that I was taking this jewelry thing seriously from early on, so I didn't waste any time or money on the smaller, hobby version of a torch, and I can't tell you much about them. 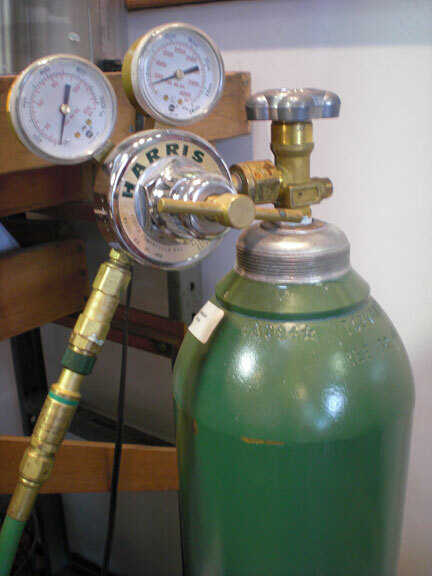 I went straight for the trusty standby that was the do-it-all tool in the busy shop of my first apprenticeship: Hoke, oxy-propane. 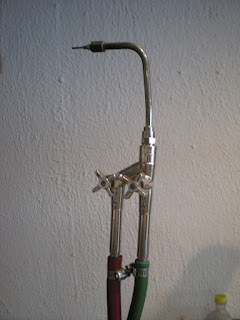 Hoke is the brand name of this torch, quickly recognizable by the front facing dual knobs and the quick change tips: The brass ones come standard, but require a wrench to change out. A set of quick change adapters giving the flame a quick and versatile range of size. It was a clear choice, but not an easy one. I had to buy hoses, fuel valve regulators and an oxygen tank at a welding shop. I then had to go to a hardware store for a propane grill tank and an over-sized wrench. As you picture me taking a wrench to a propane tank in my apartment bedroom, you may be asking the same question as my roommate. Is that safe? My answer is that no, it probably isn't safe to put a propane tank in your bedroom. It is not advised to keep a flammable fuel tank indoors. Why, then? because I was bound and determined to gain the skills of a serious jeweler. How did I avoid getting kicked out of my apartment? I may have put the laundry pile over the tanks when the landlord was around. Is that safe? definitely not. After successfully tightening the hose to the regulators and the regulators to the tanks with a temendous wrench, I was feeling like Rosie the Riviter. After checking for leaks by applying soapy water and looking for air bubbles, it was the moment of truth. Time to light this thing. It worked....kind of. the flame would light, but the knobs seemed almost squishy. They didn't stay in place. It wasn't that they were uber-sensitive. They would slowly fall back after being carefully placed. The trouble here is pretty serious. 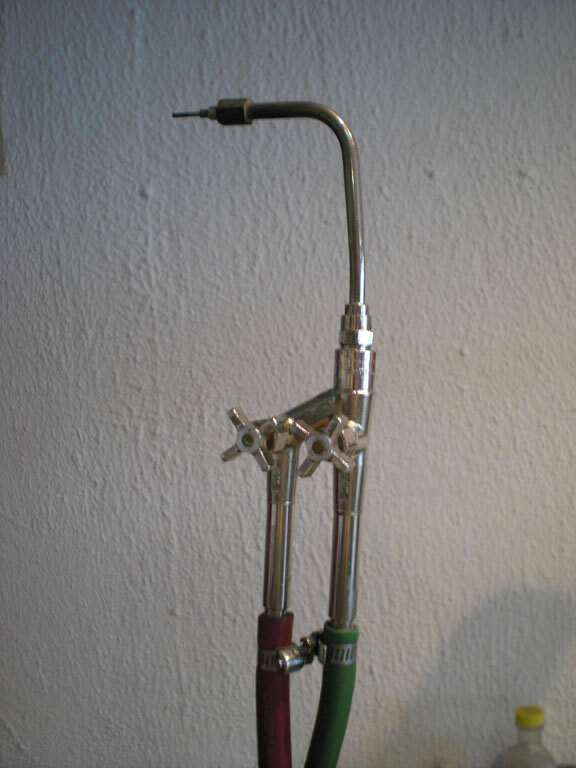 When too much oxygen is present, the flame becomes intense, hissing, and eventually blows out the flame with a startling pop of pressure in the torch tip. Oh, What to do! the manufacturer says it's fine, just loosen the knob really far and put it back. A few metal-head friends took a look and had no bright ideas. I was resigned to the thought that it needed to be "broken in" All torches that I have used have seemed finicky at first. They are difficult to light and control. Fire is difficult to light and control. And so it was. I may have had nightmares about leaving a tank on or a line unbled, but I learned by living with my torch about respecting its danger, and standing up to it. I never spoke much about the trouble it gave me, just kept on trying, trusted myself to take care of it properly, and remember always to shut down all parts. Now, 6 years later, it works like a charm. I don't know if I broke it in, or if it broke me in, but we live in harmony, my torch and I. You'll be happy to know that we have a studio together now. Or a flame of less than an inch in length for joining tiny, delicate, gold parts. Now, I am in torch-love and I would never trade it in for another, but that's not to say I wouldn't buy a bigger one just to have fun with. Please research thoroughly any decisions to setup for a torch in your workspace. Follow manufacturer's instructions. This is not intended as an instructional guide for torches. These are some of my favorite things: dapping blocks, anvils, mandrels and chasing tools....and my pink countertop....It makes me feel like a lady, even if I am wearing saftey gear while pounding out some metal. The anvil on the left is a very classically Looney Toons looking one, but I probably use it less than the much smaller one to the right of it. The large wooden cutting board helps absorb some of the reverberation from hammering, but it needs bolted down because it jumps all over the place when I'm hammering heavy metal. It is a temporary solution until I can convince enough of my friends to help me move my 4x4 foot solid maple butchers block....it makes a great surface for hammering, but it weighs a TON! Below the counter-top pictured above, I have a shelf which doubles as a hammer rack. It was really simple to drill large holes in a row to keep the hammers organized. 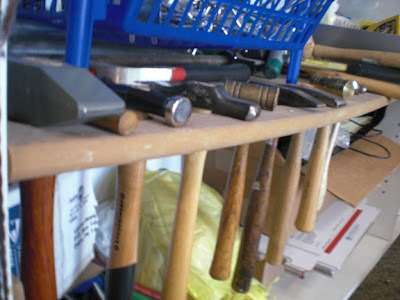 It is good to store your hammers in a rack....keeping then piled up in a box can damage the hammer heads if they clang into each other when you put them away. Tool storage is one of the things that you really need to customize on your own to keep everything handy. There are some racks and fixtures available for craftsmen, but they are sometimes overpriced, and frequently do not reach your very specific needs. 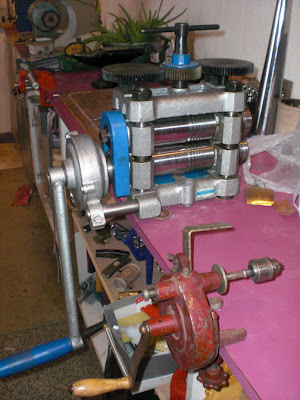 The rolling mill pictured is not a fancy brand name, I bought it on Ebay, and it was the best deal I could find after price comparing for weeks. It does a great job. The flat steel rollers were in perfect condition, and the progression of the wire slots is comfortably gradual. It even has some 1/2 round wire slots on the right end. The other tool pictured is a jump ring winder that I upcycled out of an old hand cranked grinding wheel....I just took off the wheel and welded a jacob's chuck to the axis. A graduated set of round steel mandrels is used to wind the jump rings on. They are a little expensive, but after trying to cut jump rings off of a wooden dowel, the price of the steel mandrels didn't seem so bad anymore. 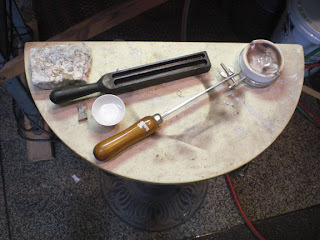 Polishing is integral to how I create jewelry. I like the look of a polished piece, and it is sometimes difficult to achieve. Often, items that are finished with a high polish are polished many times during the building process. 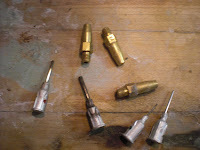 Each of the parts are often polished before they are attached together. In this way, tiny spaces that are made from the attachment are pre-polished underneath, yet every time something is soldered to the piece, some of the shine is lost, and the whole piece may need polished again! This is especially true when working in silver as opposed to gold, which keeps it's shine better (not perfectly) through the soldering process. This is the polishing area of my shop. Keeping it clean from the dust that flies when polishing is important to continuously achieving a serious shine. A powerful dust collector is very helpful in this matter, but even with one of these, there are particles that collect on the countertop. I keep a dustpan and brush close by to clean up before and after working here. That dust has metal in it, so I keep a bucket underneath to collect the dust for refining. The wheels for each grit abrasive are kept in baskets with their respective compounds. Keep lots of fresh wheels handy. If items are not cleaned thoroughly between tripoli and rouge, they will contaminate a rouge wheel quickly. It is also a good idea to keep separate wheels for different metals. Because I do a lot of polishing, I have started to wear gloves. They are similar to nitrile gloves, and simply tear away if caught in a wheel. I have heard a few conflicting philosophies on this matter. I have seen folks wearing nitrile or even heavier gloves while polishing. I have heard others say that it is dangerous to wear gloves while polishing because they may get caught in the wheel and cause injury to your hands. I am interested in any thoughts on this matter. As a teacher, I am uncertain what to tell my students about this as well. Do you ever have something in your hand, and 5 seconds after putting it down, forget completely where it is? This happens to me all the time. It can be really frustrating. If it was something valuable like a gemstone, you get all upset about it, but if it is a tool, it is frustrating that you are spending so much of your time looking for it. Your jewelry making workbench, table, or tackle box is most likely full to the brim of small parts and hand tools. It is easy for things to get lost in the shuffle. To remedy this problem, I have a few solutions. 1) Have designated container for all small parts pertaining to the current project. A small plate will do, or some people use their steel bench block. Also, try to keep small parts from different projects separate, in labeled envelopes or plastic bags. 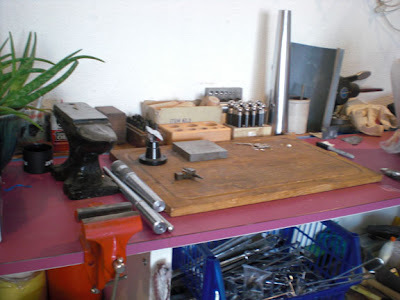 2)Have a small table adjacent to your workbench or within an arm's reach of your workplace where you can keep all of the tools that tend to get lost. I keep all measuring devices on my separate table so that I never (or rarely) spend 20 minutes looking for a ruler. 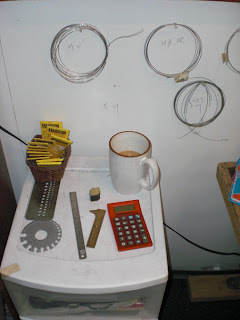 I keep my coffee here too....it is farther away from all the dust and metal that flies around the workbench. The drawers below hold respirator and safety glasses, it is too tempting to get to work anyway even if you can't find your safety glasses. I keep several pair at an arm's reach, so there is no excuse...if you love your vision, keep it safe! 3) Also pictured, I keep wire solder in coils tacked to the wall. Everyone has their own system for labeling solder by putting a different type of bend in the end of the wire, be sure to write down your system somewhere that you wont loose it. I wrote it on the wall...There is nothing worse than being unable to use the solder you bought because you can't tell what grade it is. 4) I couldn't keep track of my scale for the longest time. It was a little pocket scale that had a black cover, and it would just disappear whenever I needed it. So a friend of mine gave me a tip: spray paint the cover of the scale hot pink or some really bright color. I did this, and now I never loose track of the scale. I'm sure it would work for any number of tools that just seem to get lost.